Weaving is one of the most peaceful crafts you can find. As you create a pattern, the gentle back and forth motion of the warp and the woof can lull your mind into a meditative state. And, when you finish your work, you'll have a useful object to add to your household. Making a seagrass chair seat in a checkerboard pattern will give your furniture a modern, Shaker look. 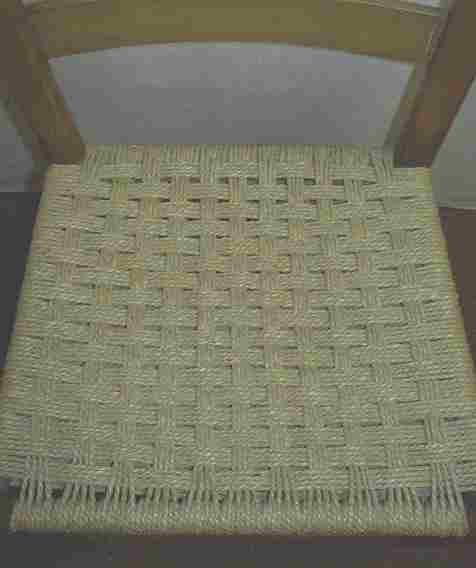 Begin weaving the warp, which is one length of seagrass from the front to the back of your seat. Tack the end of the grass to the underside of the back seat rail. Pull it behind the back rail and over the top of the seat to the front rail. Pull the grass down under the front rail and back up behind the back rail. Continue to wrap the front and back rails until the back can't take any more rows. Make certain that the number of rows of warp can be divided by four. If not, squeeze more in or remove a few until you can get a number that can be divided by four. Tack the end to the underside of the side seat rail, close to the back post, and cut the seagrass. Slide a thin cushion between the upper and lower layers of warp, after trimming off approximately a one inch triangle from each corner. You may have gaps on either side of the seat, if it splays out. These will be filled in later. Start the woof, which are the rows that go side to side, on the underside of the seat, and are centred on the back rail. Push aside one of the centre rows of warp and tack the woof underneath it. Begin weaving on the underside of the seat by going under four rows of warp, over the second four rows, under the third set of four rows, etc. until you get to the end of the row. Pull the grass over the side rail and weave across the top in the same way. Continue for four rows to establish a checkerboard pattern. Complete four rows, then turn the seat over once again. Weave in the opposite manner to the first row. Go over the first four rows, under the second four, over the third, and so on. Continue weaving on the underside for four rows. Continue the pattern until the woof is halfway between the front and back rails. Do not cut the woof as you fill in the triangles. If you have a square seat, you can continue on, skipping Section 3. Finish the open triangular areas on either side of the seat by pushing back the rearmost row of woof at the side rail. Tack the seagrass to the side rail and reposition the woof grass so both the tack and the end of the seagrass are hidden from view. Weave the warp to the front, maintaining the checkerboard pattern. Pull the seagrass around the front rail and weave it to the back. When you've filled in the triangle, tack the seagrass to the side rail using the same hidden method. Tack and weave extra seagrass on both sides to fill in the open triangles. Continue to weave the woof to fill in the seat. Use the blade of a screwdriver, or the handle of a spoon to force the seagrass through the narrow spaces, as you get closer to the end. When the last row is completed, tack the end of the woof on the underside of the front rail. How do I weave a fibre rush foot stool?